There has been some rather serious talk on here in the past couple of weeks, what with trust, honesty and then the impromptu prompt which led to a discussion on mental health and cancer. And then more discussion on mental health and cancer. So I have decided that I should punctuate this with a bit of a change. (And I do mean punctuate – these topics are too important to move away from). Change is the Big Word on everyone’s lips in this neck of the woods at the moment. It is all around us and causing a great deal of interest and curiosity. I have suddenly become highly popular (purely by virtue of being here just now) and I am constantly being asked whether I think there is change underway. It is incredible to be here and enormously encouraging. I am fascinated and optimistic. And while all of that change is going on, there is a different change in the air. That of the change of season. 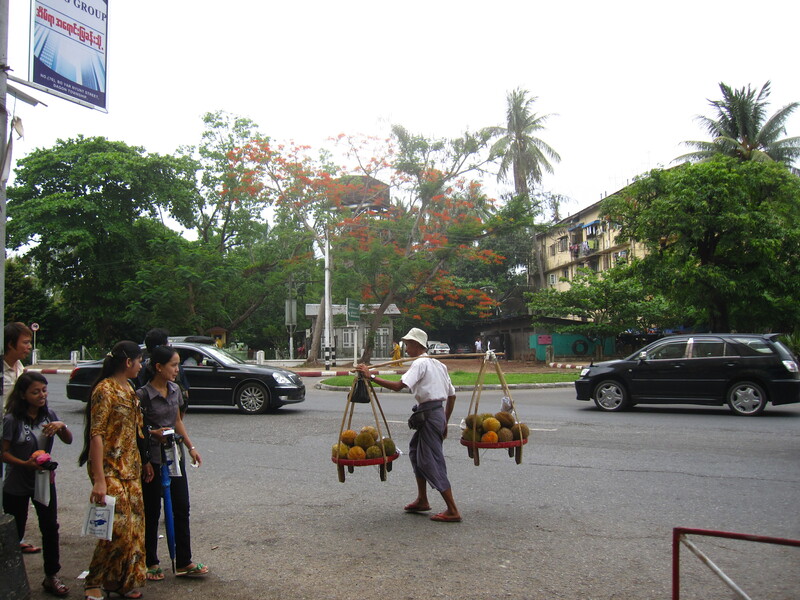 The hot, dry season becomes more and more hot and less dry as the humidity increases and monsoonal clouds gather a few days away. 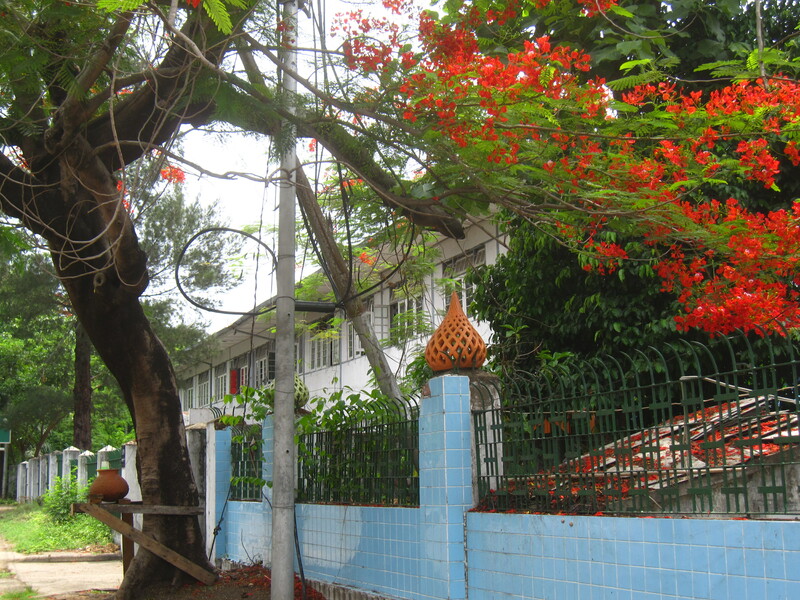 The greatest barometer of that change is, in my view, to be seen in the riot of colour which erupts in Yangon during this pre-monsoonal season. I completely missed it 2 years ago, living in a radiation bunker and hiding away with my shiny, bald head. So when I woke up to the spectacular colour fest all around me last year, I was totally taken aback and spent the weeks gasping at and admiring the incredibly bright colours everywhere. 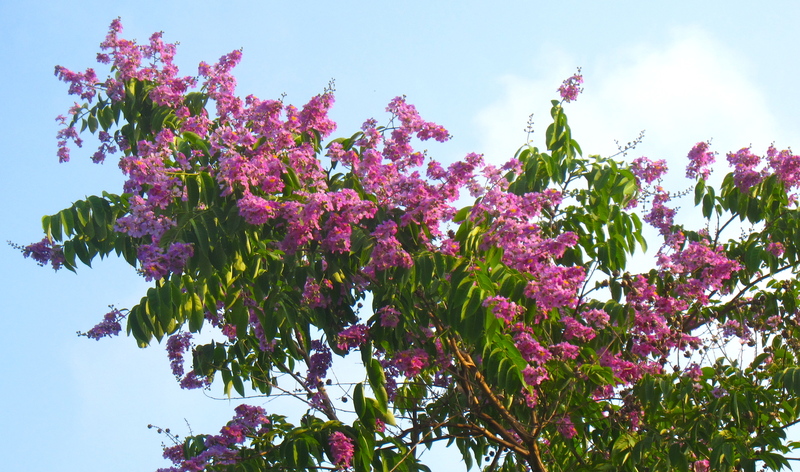 The colour seems to start with the jacaranda, and a variety of purple blooms take over the city. 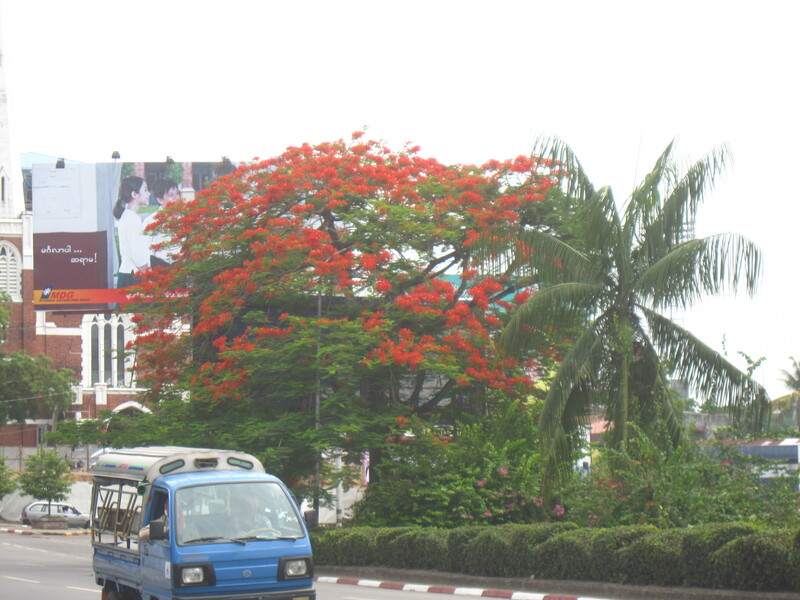 Then the yellows, oranges and reds of Padauk, flame and other trees, with all manner of coloured blooms appear, contrasting vividly against the green foliage. 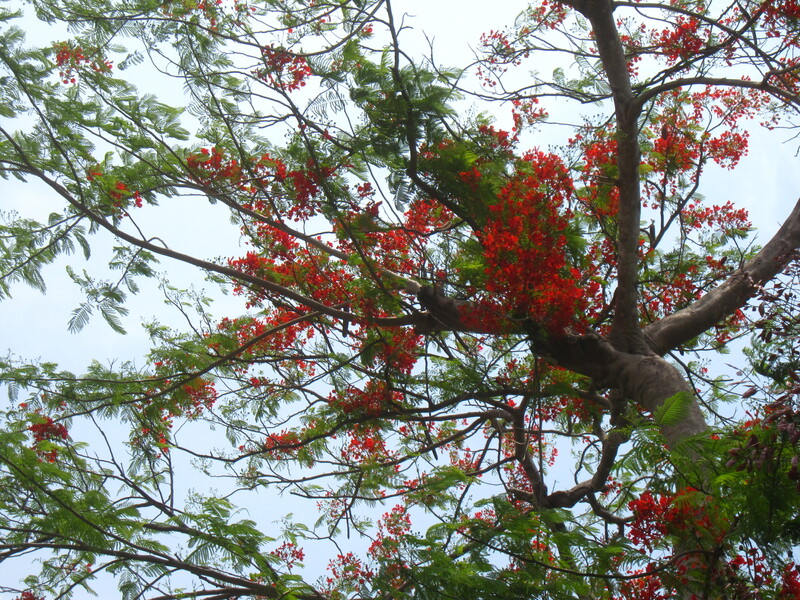 The flame tree looks as if it has no foliage at all and stands out dramatically. 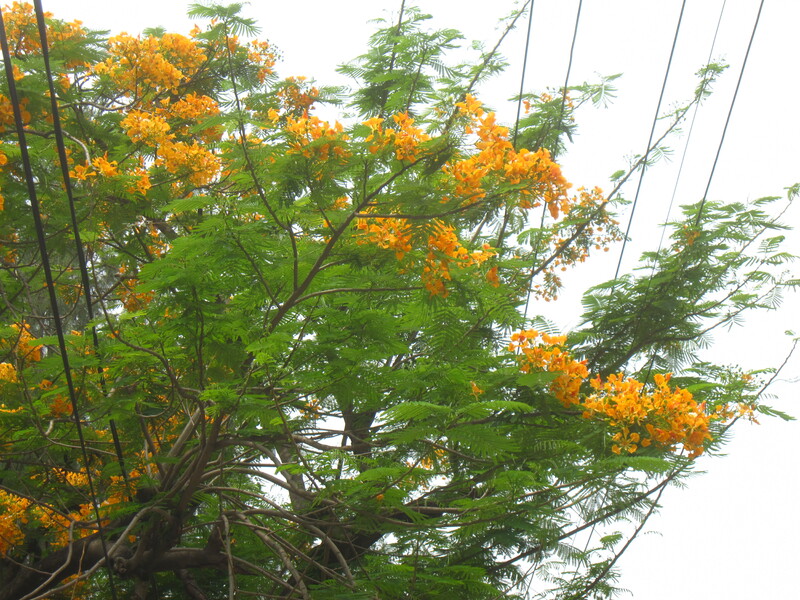 While travelling with a colleague yesterday, she pointed out the orangey yellow blossoms of the Padauk tree. 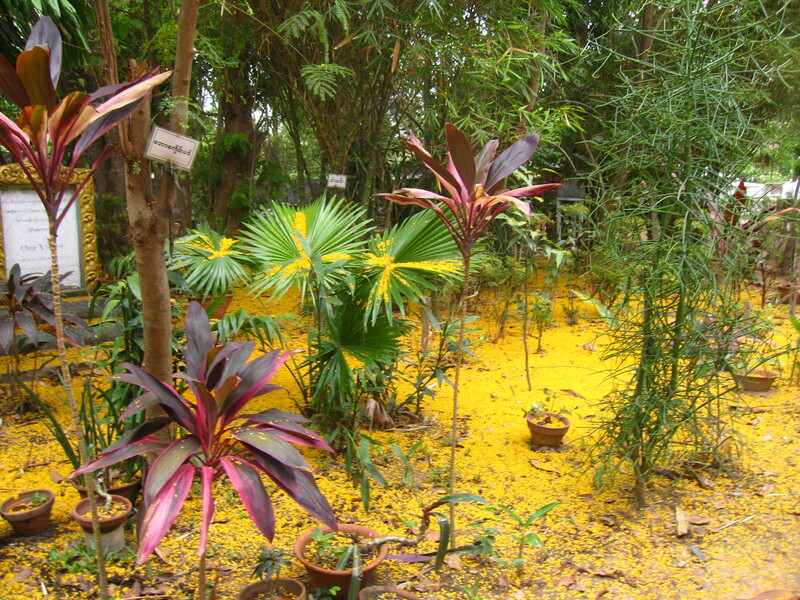 These blossoms stay for less than a day, and fall on the ground making a yellow carpet within hours of blossoming. The trees were bulging with blossom and it was hard to imagine that it would all be gone within a few hours. 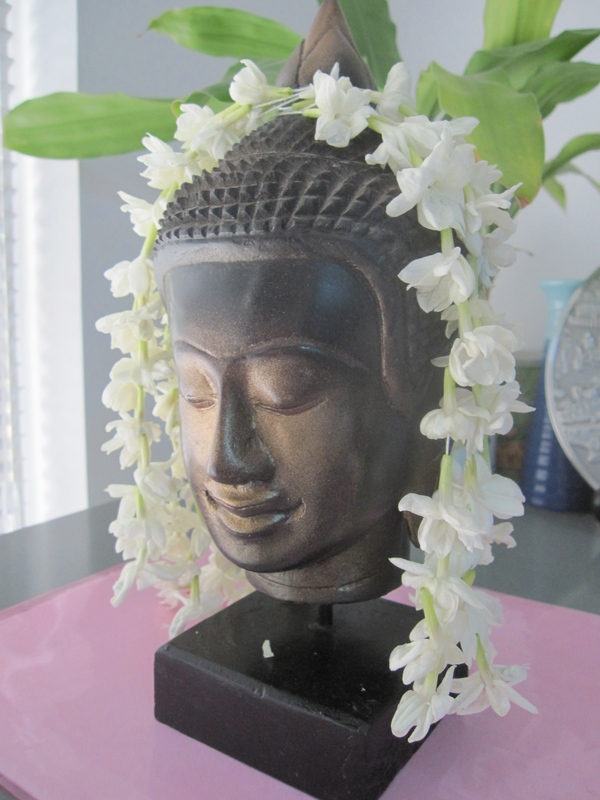 My colleague the told me that thirty – forty years ago the Padauk flowered only once, at the Thingyan festival time. 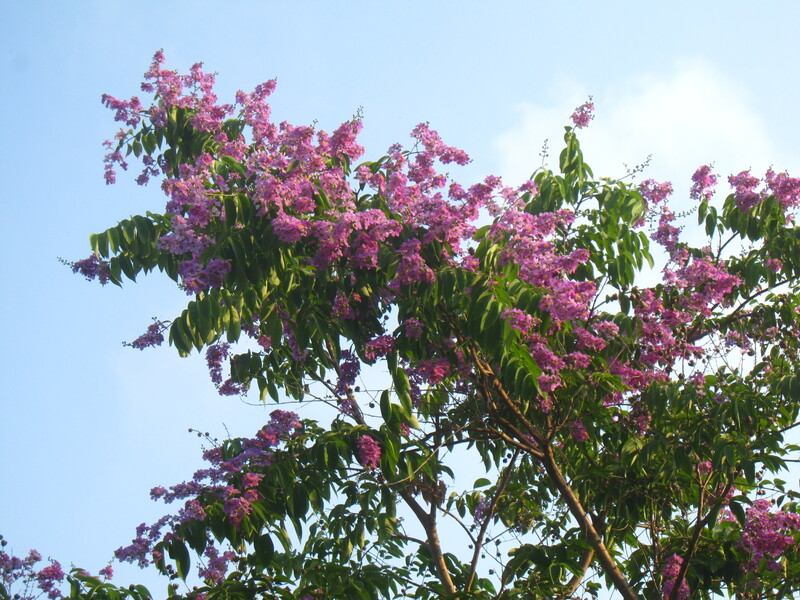 Now it seems to flower after a heavy rainstorm, the trees are forced into blossoming perhaps half a dozen times before the season passes. And the season will pass, the trees will gradually lose their poster paintbox colours as the rainy season reaches us and washes the colours away. Monsoon is imminent. It should enter the southern border and sweep northwards in our direction. We will again become used to the sounds of frogs and their loud croaking as they call out across the muddy grasses. The crickets will create a chorus of chittering anc chirruping. We hear the distant rumble of thunder and the characteristic whispering of the bamboo as the winds bring each fresh rainstorm. And the unmistakable and incredibly restful sound of the monsoon rains pouring in torrents, rhythmically drumming on the paths and roofs. There is something both peaceful and invigorating about the rains cascading. Oh yes. Change is in the air indeed and we are in a wonderful space, surrounded by colour as the air cools and the life-giving rains sweep in. My fascination in the whole matter of internet and online social relationships continues to build and is a consistent theme which runs through my blog. It was warming and affirming to see that my thoughts on trust really struck a chord too. And I loved the quip from my online mentor (newly appointed 😉 ) and guru Marie of Journeying Beyond Breast Cancer which suggested that a PhD in internet friendships and their complexity. What a dream that would be to follow. Can you imagine the amazing field research that would involve? Reading all the blogs from my new-found friends and then arranging to meet as many as I could. A study proposal is forming far too easily in my mind! But all of that is fantasy. Well for now it is….. But I was keen to revisit briefly the them of trust and reflect on the many comments which came in. What I found particularly interesting is that although the topic is potentially controversial (or so I had thought), there was clear consensus around our online community. That does not mean that it is not a complex and sensitive topic but this did reaffirm for me the very essence which was in my original discussion. That of the strength and overwhelming sincerity in our community. The post and discussion brought out fairly consistent points. We would rather trust and enjoy the many wonderful friendships and connections that we gain, albeit running the risk of being taken in, than miss out on a new friendship. However, trusting is not easy and having been betrayed in a variety of ways, it can take time to allow ourselves to trust, especially where there are not the signs and corroborating back up which we are used to in our face to face or traditional interactions. We are not equipped for the complexities and dimensions of social relationships which the internet brings. But we are learning quickly and developing those skills! 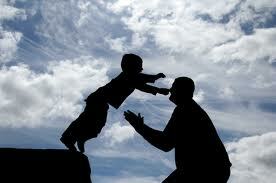 Where trust is broken or we are deceived, there is a whole swathe of online support and back up to help us through. This I am sure will continue to fascinate me and warm the cockles of my heart as time wears on and our community and interactions develop. The gecko definition which came to being in my response is consistent with the detail on the above reference. I know it is used a lot in the UK (especially in the north east of England and in Scotland particularly) and is a colloquialism for being totally astounded or shocked, kind of stunned into silence. The beautifully eloquent term “gob” is a crass word for “mouth” – “shut yer gob” is a particularly delightful expression to request someone to be quiet! I think that “gobsmacked” conveys the sense of being so taken aback and shocked at something that it feels like a physical blow. ….I’m gobsmacked about what you’re going through. I can’t believe it. But Scottish lasses are more than resilient, so I know you’ll sort this out nae bother. What are the next steps? So indeed there is a documented relationship between gobsmacking and cancer! And my interpretation of gobsmacked as a bonus! However, on top of my love of language and expression there is something which I love even more. And that is prompted by my commenter referring to her lack of familiarity with “gobsmacked” by saying “shows how little I know”. Now she is one of the wisest and most eloquent bloggesses I have been fortunate to connect with. And she is enormously unassuming in the most humbling way. No, this is not about how little we know, but rather, how much there is still to learn no matter who we re or where we are in our lives and in the world. And that was in the remainder of my comment reply. Working in the field that I do, I have a kind of “mantra” which I try to live by as well as relentlessly reminding those around me – “you learn something new every day”. I love the fact that today’s learning is about “gobsmacked”! We do learn something new every day, as long as we are open to it. And we never know who our “teacher” might be – I often learn things from my 6 year old neighbour. I am especially delighted to be part of a discussion in which an octogenarian embraces something new and looks for ways to adopt this. How refreshing and humbling. 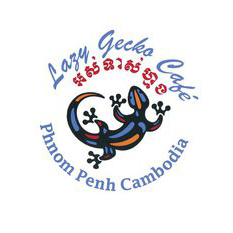 When I was in Phnom Penh recently, I discovered in the guidebook that there was a cafe called the “Lazy Gecko Cafe”. I looked it up on the map and saw that it was quite far from where I was staying and also from most of the areas I would be visiting. However, the pull to seek out this lazy gecko was strong and on my final day, I decided to hunt it down and sink a coffee or two. I tried to memorise the map so that I would be able to follow roughly where to go, wrote the address down on a scrap of paper and flagged down a tuk tuk to take me there. I explained the name of the street and off we headed. In the right direction too, according to my pre-departure map study. I love travelling in tuk tuks. I feel safe, and part of the surroundings as they are open. And much more comfortable than being inside a car. 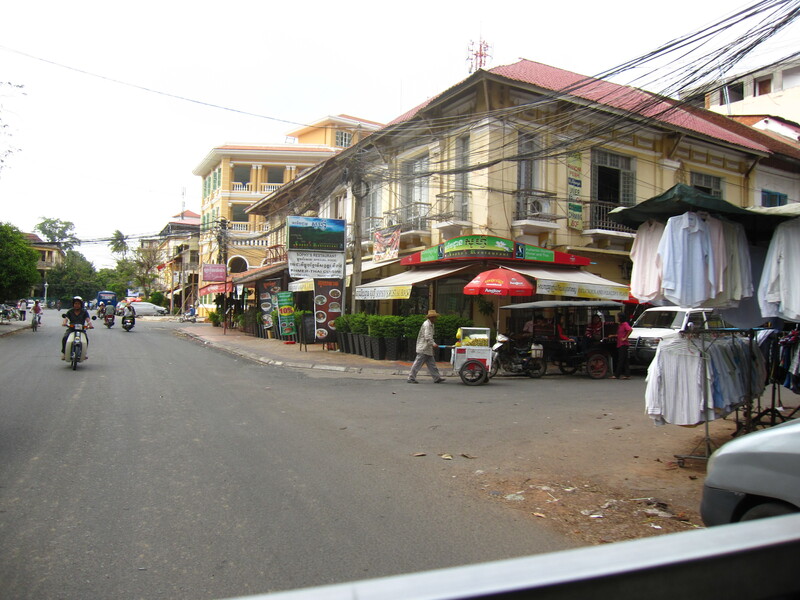 I sat back and enjoyed the jaunt through the streets, along the riverside, through the bustling market area and past grand colonial buildings. 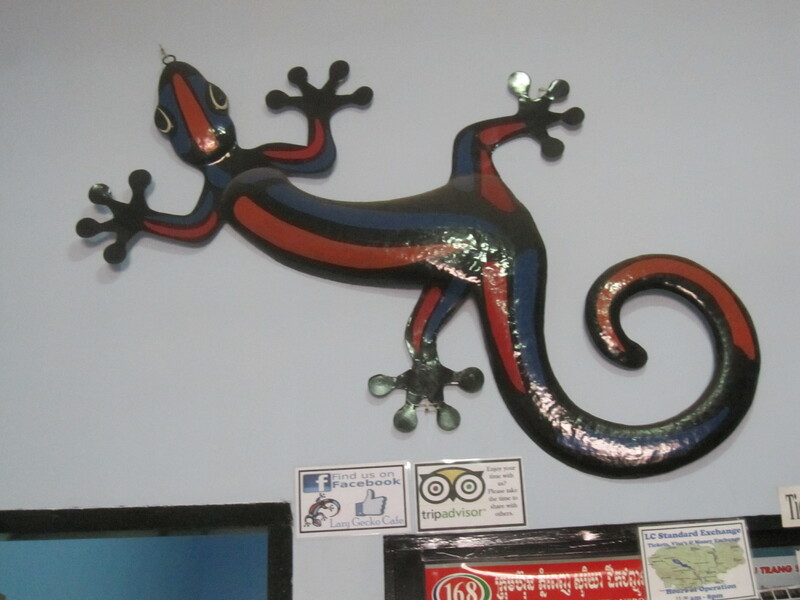 We veered down side streets, a left here and a right there and finally along a little lane where the Lazy Gecko was located. Except it wasn’t. My tuk tuk driver asked around and was told that it had moved. They gave him the new address and I tried to work out roughly where it was. Back in the direction where we had come from, unsurprisingly and not far from where I had set off! 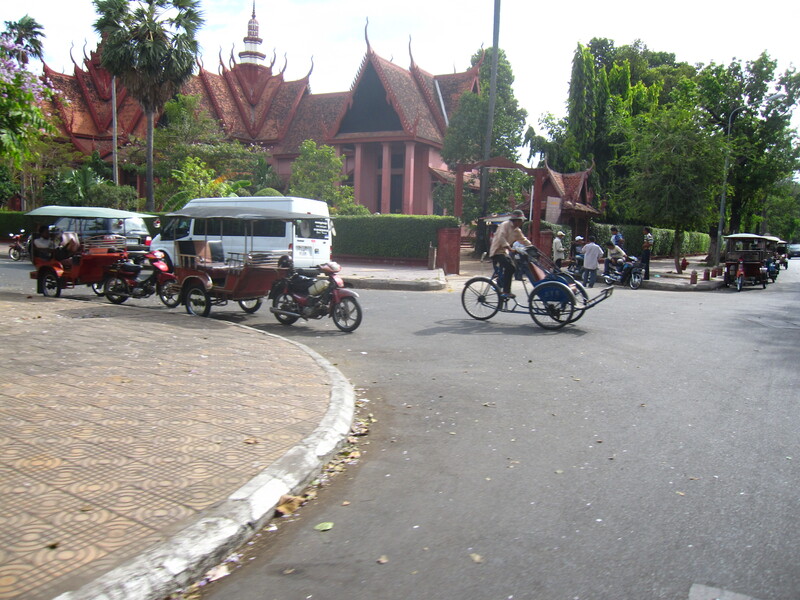 Back we headed, weaving through the streets again, past the main temple, the markets and the Palace. 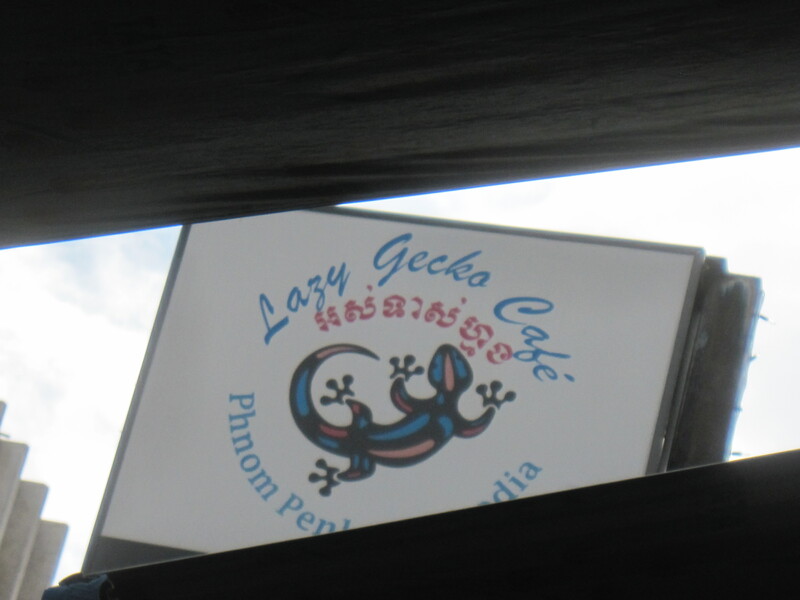 Near the riverfront, we veered into a network of criss-crossing streets and before long we drew up at the Lazy Gecko Café! I was quite delighted and settled into browsing in the shop and taking some photos before I settled down with a refreshing glass of lemon soda. I was curious about where I was though, and from my seat near the pavement, I tried to figure out which direction the river, and therefore my hotel, lay. I pored over my map and realised that it must actually be rather close but having weaved so much through the streets I had completely lost my orientation. So I asked the waiter which direction led to the river. He pointed to my left. I leaned over and peered through the trees on the roadside trying to get my bearings. I almost blushed with embarrassment when I realised that the building just across the road was none other than my hotel! 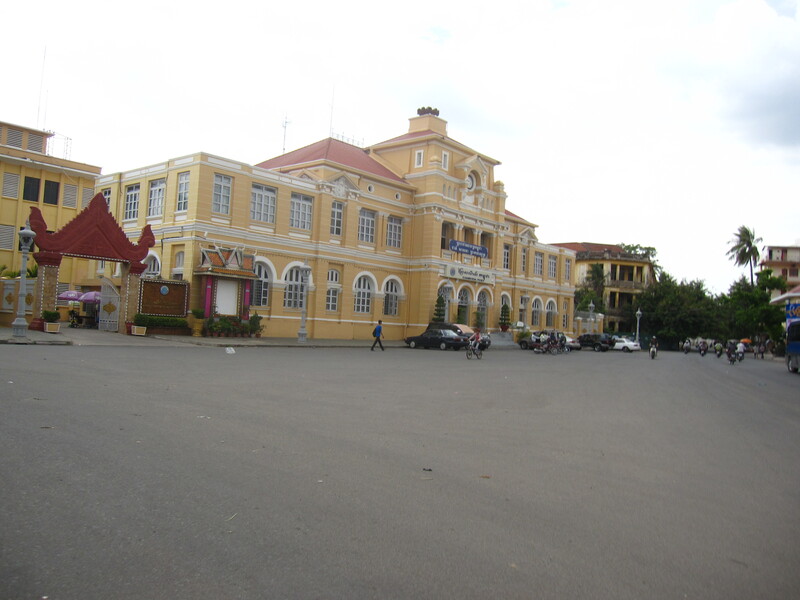 I had taken a wonderful scenic tour of Phnom Penh only to find that what I had been searching for was right under my nose all along! And isn’t that just like the thing? So often in life we spend time and energy searching for things that are much closer than we realise. In this case, though I have to say that not knowing this at the outset took me on a wonderful detour and gentle escapade, which in itself was highly enjoyable, before delivering me where I wanted to be. Right back where I had started!